From fully outsourced school bus solutions for school districts to special event shuttle services, to private school bus charter rentals – contact the transportation professionals. School districts and private schools alike want to provide the most dependable, safe and cost effective school bus transportation services to their communities. At Switzer-Carty Transportation, we deliver on this need and aim to exceed all customer expectations. Our school bus drivers are trained in effective student management and adopting the principles of defensive driving. We deliver our services in accordance with, and tailored to, specific school board policies. Our fleet is fully maintained in house following our preventative maintenance programs to ensure safe on-road operation. Our fully outsourced transportation operations are provided at the best value for money. Our goal is to provide absolute superior services within your budget. 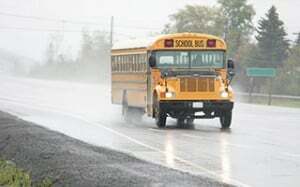 At times students are ineligible for school district supported school bus transportation. We offer private bussing services for groups of students often coming from a given neighbourhood or area where there is no services. Want to learn more about private bus service for your student community? Visit our Private Transportation page. School buses are not just for schools. Given they’re among the safest, most reliable and cost effective vehicles to operate it is no wonder that private groups and institutions contract them for services. Our yellow school buses cost far less than coach buses to operate – often less than half – which means big savings for companies or groups requiring transportation services. What types of organizations and groups can benefit from our bus services? Groups and institutions of all kinds can use our buses, whether on an ongoing, contractual basis or as one-time private charter rentals! Private individuals – yes, any individual or group can rent a bus from us…and you can quickly get a school bus charter quote now! No matter what your school bus transportation needs — whether on a one-time charter trip basis or for extended periods — we have services to meet your needs.